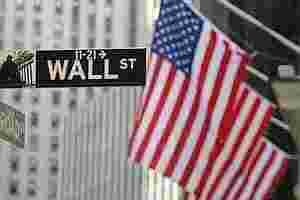 New York: US stocks treaded water on Thursday after the previous day’s massive gains, but traders worried that recent strong data could set the market up for a sell-off should Friday’s jobs report fall short of hopes. Both the Dow and the S&P 500 dipped and the Nasdaq ended with a slight gain following Wednesday’s rally of more than 4% on an agreement from central banks to provide cheap dollar loans to struggling European banks. Sentiment was underpinned by stronger-than-expected figures on US factory activity, which came one day after private-sector payroll data also exceeded forecasts. Further gains could be sparked by a significant jump in November payrolls. “At this point in time, we are definitely building for a better payrolls number," said David Lutz, a trader at Stifel Nicolaus Capital Markets in Baltimore. The US economy is expected to have added 122,000 jobs in November. Some investors think even a number slightly better than that from the Labor Department won’t be enough to justify more buying. “I can’t believe people are getting excited about 150,000 (new jobs) four years into this economic malaise," said Chad Morganlander, portfolio manager at Stifel, Nicolaus & Co in Florham Park, New Jersey. The financial sector, the strongest gainer on Wednesday, gave back some of its gains. The S&P’s financial index slid nearly 1%. “Until there’s a proper resolution among European policy-makers, wild fluctuations in equity markets will continue forward," Morganlander said. The Dow Jones industrial average fell 25.65 points, or 0.21%, to 12,020.03. The S&P 500 lost 2.38 points, or 0.19%, to 1,244.58. The Nasdaq Composite gained 5.86 points, or 0.22%, to 2,626.20. All three indexes climbed more than 4% in Wednesday’s broad rally on heavy volume, with the Dow industrials gaining almost 500 points. In the latest better-than-expected data, the pace of growth in the US manufacturing sector picked up in November to its strongest since June and new orders rose, according to the Institute for Supply Management. However, new claims for unemployment insurance rose last week in a reminder that any healing in the country’s battered labor market will be slow. Barnes & Noble Inc plummeted 16.3% to $14.59 on more than twice its recent daily average volume after it reported a quarterly loss. The bookseller was hurt by the cost of staying competitive with Amazon.com Inc.
On the upside, Yahoo Inc gained 3.3% to $16.23 after news that Blackstone Group LP and Bain Capital, along with Asian partners, were preparing a bid for the Internet company. US Airways Group Inc jumped 4.7% to $4.94 after Barclays Capital upgraded its rating on the stock. An index of airline stocks rose 1.8%. About 6.86 billion shares traded on the New York Stock Exchange, NYSE Amex and Nasdaq, below the current daily average of 7.96 billion shares traded per day. Declining stocks outnumbered advancing ones on the NYSE by a ratio of about 3 to 2. Despite the Nasdaq’s overall gain, just under 7 shares fell for every four that rose.